An 'A, B, C' day! Never work with kids or animals!! Three days of fun and friendship! Why do I do this to myself!! I've had an 'A, B, C' day today!! No, I haven't regressed to my Sesame Street or Playschool mentality (tho some would argue I've never left them!!) I had A - "A morning free of appointments and committments"; B - "Buddies to share it with"; and C - "Cake and Coffee"!! My dancing buddy, Lynda, has her birthday exactly two weeks after mine, so we usually have two coffee shop lunches a fortnight apart to celebrate. However, with my birthday falling so close to Easter and hers falling so close to the school holidays, not to mention Deb, the third member of our belly dancing trio, has been kept out of the social loop with a training course - the Triple Trouble Trio hasn't had a chance to catch up and probably won't in the coming weeks. So ... we grabbed onto this morning where all three of us were free and we hit the Coffee Club! Deb and I were very organised and had bought Lynda's pressie in the post-Christmas sales. Of course, Deb then had a job to keep me from giving it to Lynda straight away!! I'm shocking - if I buy something for someone as a gift, I want to give it to them NOW!!! Tee! Hee! Hee! We were a bit naughty, though and made Lynda carry the rather large wrapped parcel into the coffee shop! Here she is with her weighty surprise! 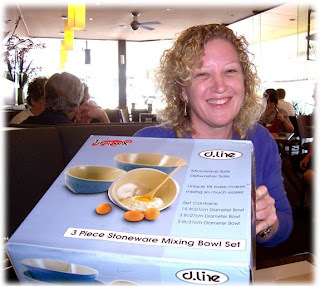 Lynda enjoys cooking and is a great baker of biccies etc for school lunches, so I'm sure she'll make good use of them, but these great mixing bowls are also pretty!! Pretty and practical! How clever were we! Lynda is a bit of a pink freak - to balance out my predominantly "anti-pink" colour selections - so the bowls will look great in her kitchen, too. We all had sinfully sweet goodies with our coffee and waddled out after a couple of fun hours of chatting, catching up and laughing. I really am blessed with some quirky, but wonderful friends!! And nicer still, Lynda gave me a late birthday pressie of some play money with instructions to treat myself to something from Kerryanne's Shabby Art Boutique! Woo! Hoo!! My friends really do know me well!!! Lynda remembered me saying there were LOTS of pretties from Kerryanne's site that I would like to have in my lounge room! I'm already looking forward to drooling over Kerryanne's pretty creations again - I'll be sure to add photos when my pretties arrive!! So ... that was how I spent most of my Saturday - how did you spend yours?? Hope you were having fun whatever you were up to, or at least felt you'd been productive!! Ooooooh!! Before signing off, Linda of the pretty birdhouses has said she'll play "Tag" so I'll wait with baited breath to see what her seven weird and wonderful factoids will be. She says she has to give it some thought to come up with strange facts about her that won't scare people! Tee! Hee! Hee! I think most of us in blogland are pretty shockproof!! Til next time, Bear Hugs! And what did I find in my email 'In' box? 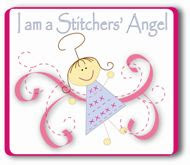 An email from the delightful Kerryanne at Shabby Art Boutique telling me I've been TAGGED! Uh! Oh! I never could run fast enough to avoid being tagged! Tee! Hee! Hee! So ... apparently I now have to share 7 weird/strange/unusual/random facts about myself that people may not already know. Hmmm ... somehow I have to pick just seven out of the many!! 1. I collect movie quotes. When I was at uni, a friend and I would alleviate the boredom of dry and dusty lectures by trading movie quotes - one would write a quote and the other had to try to guess the movie it came from. It kept us extremely entertained, though may explain our low exam results!!! Tee! Hee! Hee! My brother also collects quotes and our phone conversations often revolve around which movies we've been watching and our fave quotes from them. I also remember great one-liners/come backs in TV shows. One of my fave quotes is: "It 'aint the years, honey, it's the mileage!" Can you guess which movie it's from?!?!? 3. Particularly strange in light of the previous point's association ... I have a fear of deep darkness, particularly space!! Water deep enough to be dark scares me because of what may be lurking in its depths (too many Jaws movies!!!) but film shots from space looking out into the vast expanse of 'nothing' or particularly back at the Earth REALLY freak me out! When Lynette and I were in Townsville years ago, we watched a short film at the Imax theatre that began with LOTS of deep space shots and this was even worse than usual, as I really felt like I was being sucked into space! I think I left fingernail marks on the arms of the chair - Lynette laughed at me! What are friends for!!! 4. My brother, Paul, says I'm a left-over hippy. He points out that: I live in tiered, flowing skirts; have long hair; wear unusual and tribal jewelry with lots of dangles and bells; loooooooove windchimes; have a very healthy and well used herb garden; usually have an oil burner or incense burning to make the house smell pretty; am into natural and alternative remedies and therapies; am a bit of a greenie; and the belly dancing definitely confirmed it for him!! Hmmm, OK, so maybe he's right - peace, man!!! 5. The team I was part of made it to the state final of the Apex School Debating competition in 1985. We beat a VERY exclusive private school that had three debating coaches to make it to the final and they were NOT happy!!! We were a team from a little public school in a little country town that no one had even heard of and had one over-worked English teacher coaching all three of us! We were beaten in the final in a split decision, but were very proud of how far we got. Of course, my Dad says he wasn't surprised, as arguing is a natural talent I inherited from Mum's family! But his mother, my late Nan, had the best argument technique, I think. She'd finish an argument by saying, "We won't argue about it any more - but I still think I'm right!!" Tee! Hee! Hee! 6. I have had many nick-names over the years, but none has ever really stuck! The printable ones (!!) include: Smiley, Kitty Cat, Kermit, Pugsy (cartoon character), CJ (Court Jester) and George! George actually stuck the longest, as I worked part-time in the local chemist when I was going through Senior and the Pharmacist couldn't remember my name - so I was George!! Better than some things he could've called me, I guess!!! 7. I once won a runners-up prize in a Woman's Day romance writing competition - I got a HUGE bottle of Charlie perfume (which I couldn't wear as it made me sneeze!!). And not having completely lost my literary interests, I have two mystery/romance stories, a fantasy fiction story and several children's adventure stories in various stages of completion. Perhaps one day I'll finish them and get them published. Well ... I can dream, can't I?!?!?! So ... there you go. 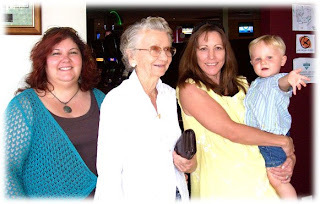 Seven random perhaps previously unknown facts about me - I've always said I didn't intend to grow old gracefully because I'm going to be one of those eccentric old ladies who are an embarrassment to their families and the life of the party!!! And now I have to tag 7 other people. 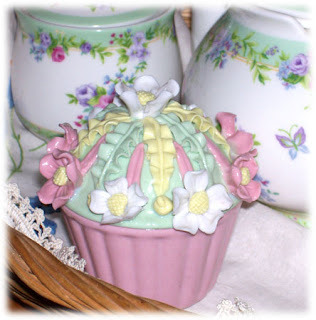 I tag: Laura from Lilly Cottage (cos I know Linda has already been tagged! Tee! Hee! Hee! 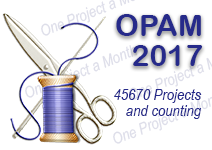 ), Lynette Anderson, Rosalie Quinlan, Gail Pan, Birdhouse designer extraordinaire Linda, Jane at Quilters World and Lisa of Button Bliss. There you go ... it will be interesting to see what they come up with! Before I sign off this post, I thought I'd introduce you to another new bear addition in the Meares Madhouse. Her name is Violet. She's a sister to Ruby and Cherry, with a couple more family members in the pipeline - something special happening with them all soon ... but I can't tell you yet!! I hope you all have a relaxing weekend and get a giggle or two from my seven random facts - make sure you check out the people I've tagged to see what fun factoids they come up with, too! Til next time, Bear Hugs! I woke this morning with a list of things in mind that I wanted to acheive today, after a week of visitors and the long weekend. I had REALLY good intentions ... until the power went out! Now, in light (no pun intended!!) of my little drama with the safety switch, my first thought was that something had thrown it again, but I decided to flick a light switch to make sure. Hmmm, lights not working - no power at all. So ... I couldn't load and start the dishwasher - oh darn! I couldn't vacuum - oh dear! I couldn't do the washing - what a shame! I couldn't update my blog - I can do that later, no time limit. I couldn't do the machine sewing I'd planned - there's always later, I guess. So much for good intentions. Hmmm, wait, there's more ... I couldn't blow dry my hair - uh oh! That's more serious, but I just wouldn't go out in public for fear of scaring small children. Oh well, being an optomist, I thought I'd sit down with a cup of tea and read for a bit. WAIT A MINUTE!!! THE KETTLE IS ELECTRIC! AAAAAAARRRRGHHHH!!! Catastrophe had struck! Tee! Hee! Hee! WOW! For someone who describes herself as a technophobe, I really am very reliant on electricity! The happy ending to this little scenario is that the power was only off for an hour and a half, so I actually did get around to doing all of those things on the list and following through on my good intentions - including finishing a new bear friend. 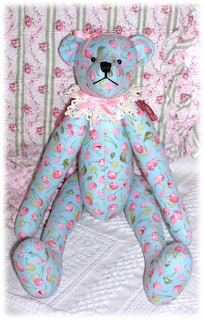 Meet Cherry Bear - for obvious reasons!! Tee! Hee! Hee! She is a cutie and I find it so interesting that despite the fact that I've designed the pattern and sewn both Cherry and Ruby - they look so different! 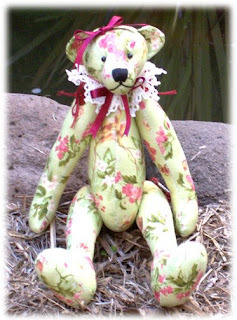 That's what I love about hand made bears!! They have their very own character - and I fell in love with this fabric as soon as I saw it. YUMMY! I have a little something in mind for Cherry and Ruby, but won't spoil the surprise yet! Aren't they gorgeous!! Mary knows my weakness for all things cupcake related and found this sweet smelling cupcake soap (mustn't eat it or I'll be foaming at the mouth!!) and these too-pretty-to-use cupcake papers. Since the papers are too pretty to use (at least until I have a special afternoon tea!) 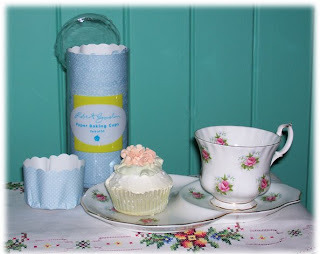 I've put them on display with my scented cupcake - right beside the wonderful tea cup and saucer/plate set I bought at Lilly Cottage. So ... after a slightly eventful, unexpectedly interrupted, yet still productive day, I'm feeling a little weary, so think I'll toddle off to visit my pillow. Hope you had a day of fulfilling good intentions! Til next time, Bear Hugs! I have a new friend, today - her name is Ruby. Would you like to meet her? 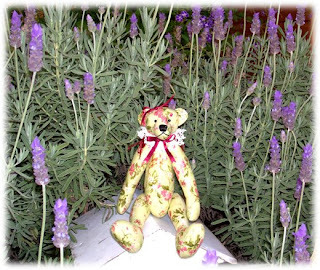 Here is Ruby playing amongst my lavender - which is flowering like crazy at the moment near our front gate. (Hmmm ... please ignore the ugly letterbox - it's on the list of things to replace, but I feel faint every time I see the ridiculous prices for plain, boring ol' letter boxes and decide to keep the old one a bit longer!) Isn't she a cutie?!! Here's another photo, a bit closer. Scott's on call for work this weekend, so I've been playing in my sewing room. This was one of those "I wonder what would happen if ...." experiments. I shrank one of my bear designs and made it up in some pretty floral fabric rather than my usual fabric of choice, towelling, and I have to say, I'm pleased with how this one turned out. She's got a little bit of an olde worlde, shabby chic aura about her! I have a little something in mind for Ruby and her soon-to-be-created family, but won't say anything yet - I'll keep you in suspence a little while longer!! 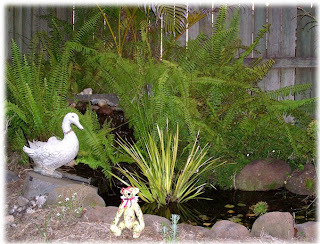 While I was outside, I took a few photos of the pond which now boasts a newly operational waterfall, thanks to my beloved Geek Boy installing the pump he gave me for my birthday. This one is a close-up shot of the waterfall, but between the overgrown ferns and the fading afternoon light, it's a little hard to see well. You do get a nice close up of our duck who had to have emergency surgery to reattach his head after a tussle with some of our nephews! He's recovered well from the delicate surgery and tries to warn all new garden ornaments of the dangers of tackling energentic boys! This shot shows the full length of the pond. Yes, it really does need a little bit of TLC! Between the drought and the brainless-but-usually-loveable Border Collie, the garden surrounding the pond has taken a bit of a beating. The fish who reside here, however, are extremely happy. Each year we see a new generation of baby fish born in our backyard - obviously we have VERY happy fish! Tee! Hee! Hee! And you can see that Ruby was helping me with my pond photo shoot - she really seemed to enjoy the garden - a bear after my own heart!! Hope you're all having a lovely break and getting to spend time doing what you enjoy most, whether that's playing in your sewing room, pottering in your garden or just kicking back having a few quiet drinks with friends and family. Til next time, Bear Hugs! A famous performer is much-quoted as advising to 'never work with kids or animals'. After a little photo session tonight, I'm inclined to agree! You see, Mum and Dad are visiting this week, along with Mum's 'baby' - a long-haired Chihuahua called Sunny, which my brother Paul and I bought for her 8 years ago. Paul and I joke that Sunny is much more spoilt than we ever were!! So ... 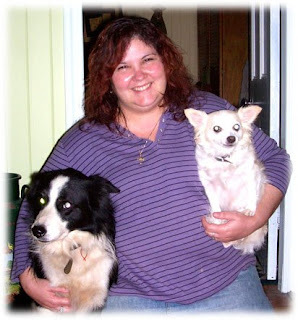 I decided I wanted to get a photo of the 'tall and the short of it' with Sunny and our boofy Border Collie, Wombat. Easier said than done!! It probably would've made a great entry for "Funniest Home Videos"! Poor Scott had difficulties galore! Imagine if you will, me, kneeling in the middle of our lounge room with Sunny tucked in the crook of one arm, with the other holding Wombat in place to stop him eating Sunny's dinner and Scott trying to get all three of us looking at the camera at the same time! The results were not Pulitzer material, believe me!! Here's the best of the bad bunch. Not the most flattering photo for any of us really! I look like I've been dragged through a tornado backwards and the dogs' glowing eyes make them look like they're possessed!! You do, however, get the general size difference I was trying to show. Sigh! Sometimes ideas are so much better than reality!! Mum and Dad have been here for a few days and have incorporated several things into one visit - Dad's annual heart specialist checkup, Mum's shopping fix, Easter and celebrating my birthday - which is today! Happy Birthday to me!! We discussed going out for dinner to celebrate then decided that since it's the Thursday before the Easter weekend, everything would probably be crowded and driving today led us to declare it official "Idiot Driver Day", so we were all happy to stay home. Mum took charge of the kitchen and as you can see, took her task seriously! Tee! Hee! Hee! We enjoyed delicious steak, fresh steamed veges and a berry cheesecake for desert - all for much less than a restaurant would have cost and Dad said the best part was that he didn't have to get all gussied up!! My Dad's from the bush!! Tee! Hee! Hee! However, I didn't take any photos of this yummy feast, because it disappeared far too quickly!! I've received some lovely gifts - isn't it nice to be spoilt for at least one day of the year?!?! 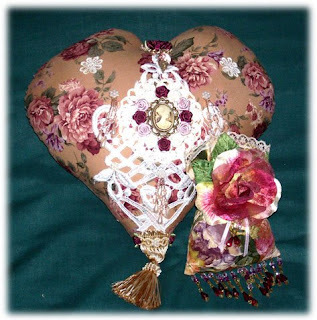 Scott's Mum and Dad are currently tripping around Europe, so my early present was a Victoriana style heart-shaped cushion and a beaded potpuri hanger which both look right at home in the previously featured spare room. Mum and Dad's gift was a promise that they'll pay for me to travel with Mum later in the year to visit my aunt who lives outside Adelaide - Yay! She and her husband have a small farm and raise alpacas (and a managerie of other assorted animals! 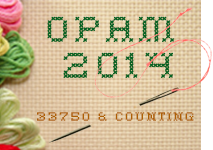 ), which I've been dying to see in person, but haven't been able to save up for the airfare before this. And from my terribly romantic husband???? 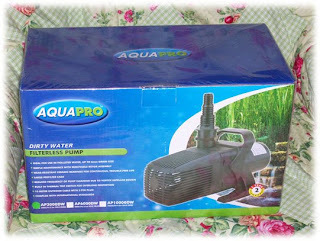 No, you're not seeing things - it's a new pump for the pond waterfall! The old one burned out some months ago and it's been on the 'must replace that one day' list ever since. Apparently, I was heard to bemoan the fact that it still hasn't been replaced so my wonderfully practical hubbie decided to kill two birds with one stone! He may not be romantic, but he is mine!! Tee! Hee! Hee! While not what I was expecting, it will be nice to have the waterfall working again. 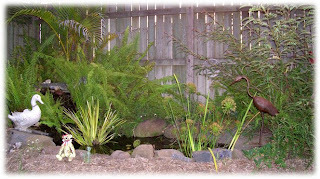 We've nursed the pond through the drought to save the fish and water plants that we've been nurturing, topping up with precious tank water to keep the mini-ecosystem thriving, so seeing the waterfall in action again will be nice, as I find water very soothing - must be a Pisces thing!! 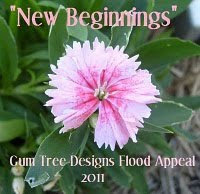 Will include some photos once the pump is installed - hope that was part of the gift or I'm up the creek!!! While I haven't done anything very extraordinary for my birthday this year, I have to say I've enjoyed it a lot - some lovely pressies, lots of SMS messages and phone calls from friends, a delicious home-cooked meal and surrounded by the people I love most - does life really get much better than that!!! Of course the down side is that I now have to remember how old I am - it's taken me the last 12 months to remember last year's increase! Tee! Hee! Hee! And as this is so close to Easter, I'll wish you all a Happy and safe Easter break - hope you spend it with those you love and if you're travelling, take care. Til next time, Bear Hugs! That was me today - although I didn't have John Farnham seranading me - more's the pity!! My parents are arriving tomorrow for a visit, so it was all hands to cleaning stations today in the Meares' Madhouse! Now Geek Boy and I are NOT what you would call the neatest people in the world - far from it! As I told the lovely Linda of Lilly Cottage last week, 'Dust' is a four-letter word in our house and people are instructed that if they MUST write in the dust, then PLEASE don't date it! Tee! Hee! Hee! Being busy people who somehow missed the tidy gene from both mothers, we tend to cover flat surfaces (those not housing bears!) with 'stuff' - we come home, dump whatever we've been carrying, eat, change clothes, grab the next armful of 'stuff' and off we go again. Then, every now and then (often when guests are due to arrive!!) we get stuck in and have a big tidy up. That's what happened today!! The house has been tidied (though I'm not showing you the sewing room, as it still looks like the 'before' photos shown recently!! ), vacuumed, the bathroom cleaned, the lawn mowed, the carport swept - it's been all go here today! And much to his disgust, Womat had a bath! 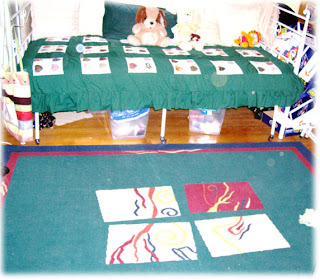 So, while things were a little tidier than usual, I thought I'd share some photos of our guest room. It's the only room in the house that's completely painted and finished (apart from the curtains that I haven't yet decided what I want to do!!) most other rooms have had varying degrees of work done to them - our house is a work in progress!! This is the view of the guest room from the hall. The bed matress is over 100 years old - a friend wanted her great grandmother's bed frame but not the matress! - and takes three strong men to lift, but BOY! is it comfy! Lots of guests who usually wake early, find themselves sleeping so well on it that they sleep in! That's what we like to hear! I love our guest bed almost as much as our own bed. The gorgeous knitted quilt was made by my Great Granny from white cotton, knitted in smaller squares, then joined together. It's almost 90 years old and very precious to me. 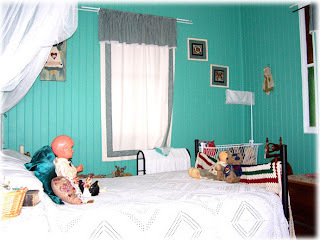 The doll sitting in such spledour is a celluloid doll that was played with by my grandmother, then my mother and languished for years in a dark cupboard until Mum made his new raw silk shirt and velvet breeches for him to come and live with me. And I'm batty about mozzie nets!! This fabulous rocking cot came from the Mundubbera Hospital when they sold off all old fittings in preparation for the new building and equipment. Though she doesn't share my love of antiques and all things old, Mum bought this and had it powder coated for my birthday a few years ago. 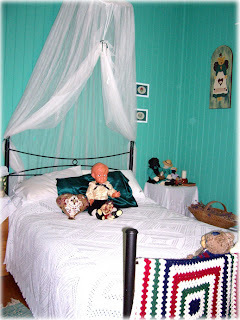 It is now a comfy home to some lucky bears and dolls. The spinning wheel is a Thumbellina and I actually learned to spin on it when I lived in Bourke, but a spring got lost in our numerous moves and I haven't got round to getting it fixed, so for now it just looks great! This cozy corner is great for curling up with a book - although you'll have to share the space with my childhood companions - Sam the sausage dog, Pinkie and Clown (you should be able to guess which is which!!) and my recent adopted bear Rupert. The display case in the corner houses two baby's dresses - one is made from the wedding dress petticoat of the same great-grandmother who knitted the quilt and the other was hand stitched by my Grandma and decorated with chrochet edges when she had a small baby in Emerald's 40 degree summer, as silk was the coolest fabric around. The model boat was started by my Gramps before he passed away and Scott finished it off. It's rigging is all hand-knotted and it's all very detailed. You can see a couple of Pirate Beanie Bears and a Beanie Mermaid have taken it over! Aha, me hearties! 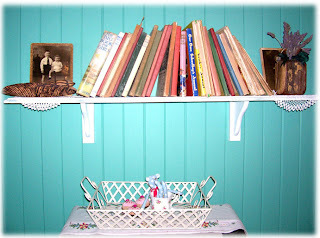 This shelf is home to a collections of wonderful old books that belonged to Mum, Dad and Dad's late brother. Most are the "Boys Annual", "Big Book For Girls" type of books. My favourite has a very early version of the Rupert the bear comic character - fitting considering 'My' Rupert is nearby! 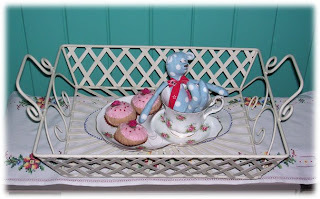 And the cute shabby chic tray was a bargain hunting trophy and is the perfect place for my newly aquired goodies from Lilly Cottage. So, there you have it - the grand tour of the Meares' Madhouse Guest Bedroom!! Hope you enjoyed it because it will look very different after Mum and Dad arrive tomorrow!! Tee! Hee! Hee! Whether you're donning Sadie's apron and cleaning gloves, or enjoying the fruits of your weekend's labours, I hope you have a great week. Til next time, Bear Hugs! That's what I've just enjoyed! I have been visiting my best friend Lynette in Brisbane for the last three days and we had a blast!! Now before going any further, I'll warn you that we packed a LOT into three days, so perhaps you'll need to make yourself a cuppa and get comfy before reading on!! 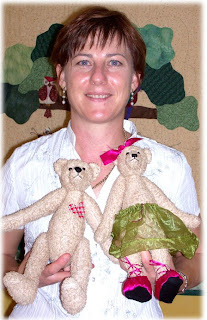 Lynette finished her goal of making two bears - Duncan and Danae! Since this was her first attempt at making bears, I think she did a BRILLIANT job!! And I'm not just saying that cos I know she'll read this! Tee! Hee! Hee! See for yourself! Don't they look great! I love the bright, funky colour combo of Danae's dance outfit. Lynette was (justifiably!) very pleased with herself, and she has a new appreciation for what I do, as she had sore fingers and hands by the end of two days stuffing bears and thread-jointing with a large doll needle that sometimes had a homing beacon for her fingertips! Lots of 'Ouch!' yelps! It led to her striking a dramatic pose and claiming she was suffering for her art! Tee! Hee! Hee! Yep, she's as silly as I am, how do you think we've stayed friends for almost 30 years!! Now, you may recall in my last post I lamented the fact I had not completed my "To Do" list, which included finishing a couple of dolls. 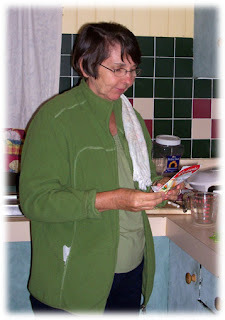 While Lynette was busy on the sewing machine, I was also hard at work - between issuing orders and instructions! I finished two more Cupcake Katie dolls - one as a surprise for Lynette (she knew I was giving them both away, just didn't realise one was to her!!) and the other to be delivered the next day - more about that in a moment! 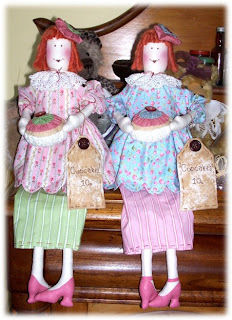 Here are the completed dollies. The pink and green clad Katie is now living with Lynette, while the blue and pink Katie joined us for an adventure! For a while now, I've been chatting via email and blogs with the Lovely Linda and Laura of Lilly Cottage and I was VERY excited to find their shop is in Brisbane - the opposite side of town to Lynette! However, being intrepid explorers and having come 2nd in our year 7 orienteering challenge (we'd have been first if a team of boys hadn't run the entire course!!!) Lynette and I decided to set out on a mission of exploration to visit Lilly Cottage. Step one: consult the refedex. With directions in hand, off we went! The hour's drive went quickly, full of chatting and laughing, though anyone listening would have needed an interpreter for our shorthand conversations! We've known each other so long and are SOOOOO on the same wavelength, that we don't always finish sentences or fill in names because the other just KNOWS what is being said! And it's not unusual for one of us to say somthing out loud just as the other has opened their mouth to say the same thing! We joke about sharing a brain!! So ... an hour in the car - more opportunity for chats! We soon spotted a sea of pink - Lilly Cottage! So out we hopped and were greeted with an enthusiastic hug from Linda!! How lovely!! And Laura made us feel just as welcome! While Linda popped the kettle on and Laura found some hot cross buns for morning tea (it is almost Easter, after all!!) 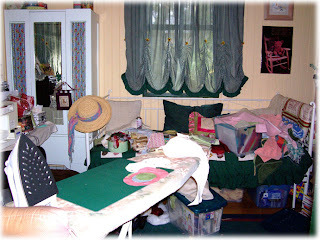 Lynette and I had our first browse around Lilly Cottage. Lots of 'oohs' and 'aaahhs' and 'look at this!'. So many pretties!!!! Some were DEFINITELY going home with me - after morning tea! 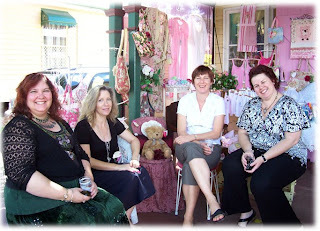 The four of us found a nice spot in front of the shop and spent a very pleasant 2 1/2 hours chatting, laughing and drinking tea, with Lynda's Mum popping in and out to see what we were up to. I just love meeting people you immediately feel comfortable with and that's how both Lynette and I felt meeting Linda and Laura - similar interests, similar tastes, similar senses of humour and a taste for tea and buns - a sure recipe for new friendships!! Here we are enjoying morning tea. You can see some of the pretties in the background! There were just tooooooo many items I wanted to take home with me. However, I did keep my promise of trying to be good and only bought a few goodies. I loved the delicate roses on this set, even though the cup had a little crack in it and I knew I didn't want to drink tea out of it because I wanted to sit my new little bear friend in it! Meet Pippin. I saw him on Linda and Laura's blog badly outnumbered by Easter bunnies, so thought I would adopt him and bring him home to live amongst the numerous others of his kind who live in every room of our house!! We had the most WONDERFUL time with Linda and Laura at Lilly Cottage and I will definitely pop back whenever I can, not to mention continuing the online chatting with them both and enjoying updates on their blog! Thanks heaps, Linda and Laura - and Linda's Mum! 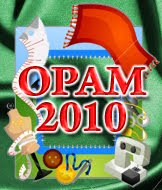 - for your wonderful, warm hospitality and growing friendship!!! It will be even more fun to read Linda's blog entries and emails now that I can put personality and picture with the fun writing!! I also left a little bit of myself behind (almost my bag of goodies when I visited the shop next door for a look!!) as I left the second Cupcake Katie shown earlier to keep Linda and Laura company at Lilly Cottage. While I didn't get a photo, Linda did, so I'm sure it will soon be on the her blog! Katie is a friendly dolly so I'm sure she'll settle in quickly and feel right at home amongst all of the prettties at Lilly Cottage! So, then it was time to hit the road again, back to Lynette's place, where she surprised me with an early birthday present (birthday's next week!! Uh, oh another year older and a new age to try to remember!!)!! 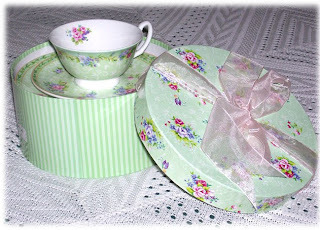 It's such a pretty set - and I AM a green girl!! Lynette has been buying me the trio sets and the tea pot for my birthday and Christmas presents for the last couple of years - aren't I lucky!!! She also bought my lovely (and very handy!) plate stand that appears in lots of my photos. Yep, I'm spoilt!!! Thanks, Lynette!!! But all good things must come to an end - so they tell me, though that seems very unfair!! And it was time to pack my port (bag, suitcase!!!) 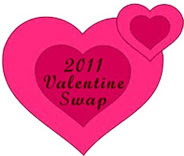 and head back up the range to my OTHER best friend (see "Two Best Friends For Valentine's Day"! ), Scott and catch up on some sleep!! A household with three kids gets going MUCH earlier in the morning than I'm used to! Tee! Hee! Hee! Lynette and I agreed we had so much fun with this mini craft retreat that we will DEFINITELY have to plan more - Lynette is already starting to write a list of projects she'd like to tackle so stay tuned for the continuing adventures!! Tee! Hee! Hee! See, I told you it would be a long post and you'd need a cuppa! However, it's me who needs a cup of tea now, so I shall sign off and go and admire my new pretties! Til next time, Bear Hugs! I don't know about you, but I ask myself this question a LOT!! My mind says, "Yes, I'll have PLENTY of time to do that, so I'll just do this first!!" And of course, reality interferes and it all comes crashing down!! That's what I've done to myself today. The exciting part of this trip, is that we've planned it as a mini craft retreat. 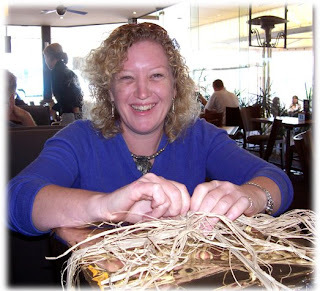 With three kids aged from 7-11 and all the associated after-school and weekend activities, not to mention working several shifts a week as a midwife working with premmie babies, plus all the house 'have-to-dos', Lynette doesn't really get a lot of time to tackle craft projects. 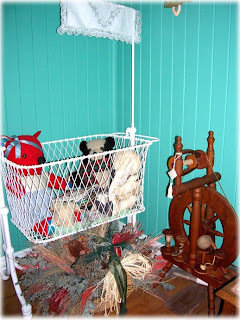 Her last project was a cute primitive style stuffed pony who, due to lack of time, took almost a year to complete. He was known as the blind albino horse, as he was put together, but she hadn't got back to give him his eyes and Parisian essence colouring for ages! Tee! Hee! Hee! So, she's chosen a project (Duncan and Danae, one of my towelling bear patterns!!) and I'll help her get them finished over the two days - that's the plan!! As a result, I made myself a mental list of things I needed to do before being away for three days. There were a couple of dolls to finish, a load of washing to be taken care of, a bag to be packed, requirements for our project to be rounded up and packed (along with most of my fabric stash - just in case inspiration strikes!!) 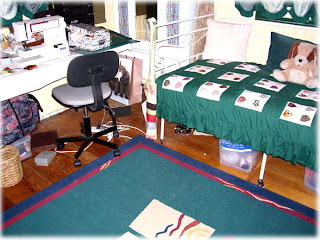 an entry on my blog and the sewing room to be tidied. At the end of a day that seems to have gone past very quickly, I can only cross one thing off the list - the washing!!! Aaaaaaarrrrrgghhhh! Why do I DO this to myself!! I'm not the neatest person in the world (did you just hear my mother hurting herself laughing at that understatement!!) but when I go away for a few days, I like to tidy up a bit before I leave, so I can come home and not have to worry about unexpected visitors disappearing should they venture off the basic track from door to chair. 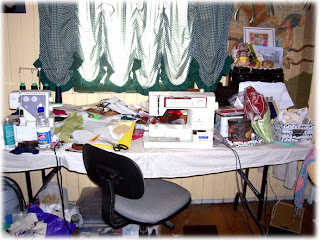 So, this is what my sewing room should have looked like by now. Three explorers of the unknown ventured in and haven't been seen since!!! SIGH!! My mother says that somehow her 'tidy gene' skipped over me - she may be right, but I don't really see it as 'mess', more as 'Creative Clutter'! It's my story and I'm sticking with it!! Although I do feel sometimes that perhaps I should get one of those "Beware! Construction in Progress!" signs to put on the door. The washing was successfully completed (no dramas in the laundry this time!! See "A Day of Little Surprises" if you want to know what I mean!! 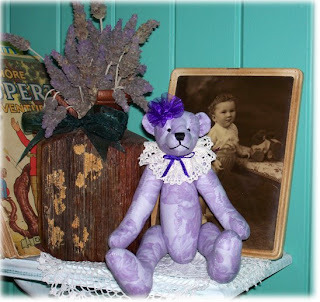 ), the dolls are half made, so I'll take them with me to work on while Lynette creates her bears and I have done a new blog entry!! I guess fifty-fifty isn't a bad result - just don't tell my mother!!! Tee! Hee! Hee! Now those of you who are very observant (or now scroll back up to check what I mean!!) will have noticed that I said I was going away for THREE days, but said Lynette and I hoped to complete her project in TWO. This still leaves a day unaccounted for. 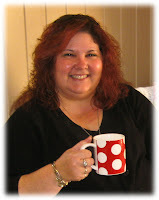 Well, let me tell you what that day will involve - I will get to meet one of my new blogging friends IN PERSON!! Linda from Lilly Cottage and I have been chatting back and forth, reading each other's blogs and admiring each other's taste in craft and decorating (we've discovered similar taste in most things!!) for a few weeks now and I was excited to find that she and HER best mate run their shop in Brisbane. So ... can you fill in the blanks?!?! I'm taking MY best buddy to meet Linda and HER best buddy on day number three and we're planning lots of tea and talk or coffee and chats!! I'm very excited about meeting Linda and Laura and drooling over the goodies in their shop that have been teasing me from my computer screen! Oops! That thump was Scott fainting of shock - again!! Tee! Hee! Hee! He's always a little scared when Lynette and I organise our 'play dates' and the news that we were hitting Lilly Cottage made him shudder harder, as he's decided it sounds very dangerous to our budget! I'll try to be good - promise!! But even if I can't be good, I'll definitely report back on our visit when I get back. Well, I'd best be away before I get even further behind - if that's possible! Hope your day has been a little more productive than mine! Til next time, Bear Hugs!! That's right, Kerryanne English of Shabby Art Boutique made me cry today - but they were happy tears! You see, I had popped out to Quilters' World (Scott says I should just move in there and be done with it!!) to get some fabric that I'll need for projects I'm intending to work on over the weekend. When I got back, I opened the front door to let in some fresh autumn air - and there was a box on my front verandah. With my birthday in just under two weeks, I thought one of my family members or friends had got REALLY organised and sent a gift early, so happily picked it up and took it inside. 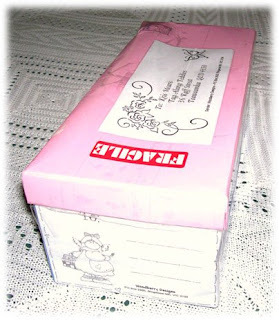 It was only then that I noticed the "Fragile" sticker, along with a Woodberry Designs label. "That's funny!" I thought to myself, "I don't think I've indulged myself with more of Kerryanne's goodies recently." So, being the inquisative sort, I opened the box. 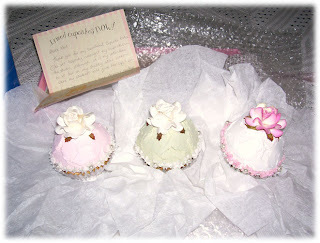 Three of Kerryanne's GORGEOUS full size cupcakes!! And THAT'S when I cried!! You see, when I ordered my sweet mini cupcakes from Kerryanne, I confessed to her that I was also lusting after her full size cupcakes, but the play money just wouldn't stretch far enough at the moment, so I was putting them on my "Wish List". Not only did she remember, she sent colours that match perfectly with the mini cupcakes I bought! Uh oh!! Where's a tissue! What a wonderful, thoughtful gesture! 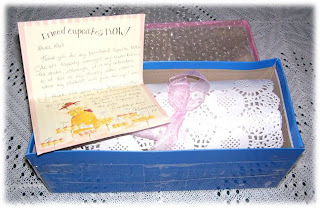 Thank you Kerryanne - you're as sweet as a cupcake!!! After I got through my sentimental sniffling, I had to rearrange a corner of my lounge room to best display my new sweeties! I found a pretty rose decorated cake plate (how appropriate!) that fits perfectly onto my plate stand. Take a peek at the result! This is now my little shrine to Kerryanne's talent! Tee! Hee! Hee! 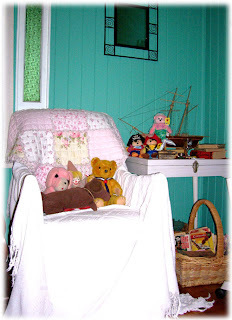 Actually, this corner of the lounge room sums up most of my addictions - bears, pretty tea cups, craft and cupcakes!! And lets not forget friendship!! Though Kerryanne and I have never met in person, we're growing a friendship via the internet and emails and she has been a fantastic encouragement to me. Uh Oh! Need more tissues!!! 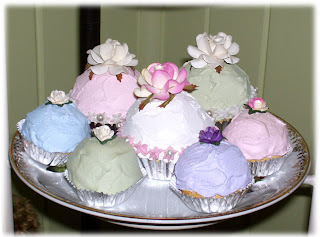 While I get a tissue, enjoy a close up look at my lovely collection of Kerryanne's faux cupcakes! Don't they just look good enough to eat!!! I also had a giggle at the notepaper Kerryanne had used. It shows a rather curvaceous lady (Like me, the sand in her hourglass figure has all sunk to the bottom!!) who looks like she's having one of my 'bad hair' days and she is surrounded by cupcakes with the wording, "I need cupcakes NOW!" Tee! Hee! Hee! I'm with her!! It reminds me of a funny saying I saw a while back that said, "Somewhere inside me there is a skinny woman trying to get out - but I can usually subdue her with 6 cupcakes, a block of chocolate and a Latte!" So ... today, I am thankful for new friends - even when they make me cry! Thank you so much, Kerryanne, for your generous, thoughtful gift! I can see I'm going to spend even more time curled up in the lounge room, stitching and gazing at my goodies from Shabby Art Boutique! And she probably won't even get my 'thank-you' for a little while, because she's taking a well-earned holiday!! Think of all the new creative ideas she'll come home with! If you haven't already popped into Kerryanne's sweet on-line world, you really should and prepare to drool!! Kerryanne also sent a 'Hello!' from Cupcake Katie who recently went to live with her. Kerryanne said that she has a place picked out in her shabby chic attic room for Katie to move into - just as soon as her folk art students will let her take Katie out of the studio! Tee! Hee! Hee! She's a very friendly doll and likes to chat - a bit like her creator!! Oops!! Anyways, I hope your day has been as full of 'sweet surprises' as mine has!! 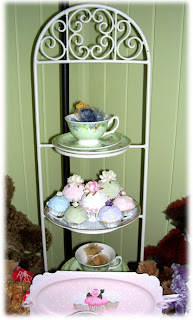 Hmmm, I suddenly feel the need for a cup of tea - must be all the talk about cupcakes! Tee! Hee! Hee! Til next time, Bear Hugs! Those who've read the previous post will know I spent the weekend catching up with my cousin and meeting her little boy for the first time. Well, one of his most-used sayings was, "Uh oh!". This could mean he'd been caught doing something wrong, or knocked something over, or lost something, or fell over when his feet got ahead of him or ... are you getting the feeling we heard this saying rather frequently over the weekend?!?! It was very cute and funny. Well, like Blake I have to say, "Uh Oh!". You see, I did something I said I wouldn't do - I started a new quilt before finishing one of my UFO's!!! "Uh Oh!!!" Tee! Hee! Hee! It's all Lynette Anderson's fault! 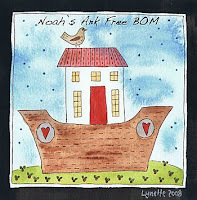 I regularly pop in to catch up with her via her blog and this week saw her start a free Block of the Month (BOM to those in the know!!) through her blog. Each month, she will have the next block available for free download, along with instructions and stitch guides - all you need to get stitching. Now, usually, I could even have passed that up because I have promised myself I wouldn't start any more quilts, but she found one of my weaknesses - a Noah's Ark theme! 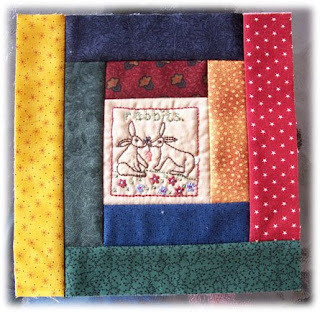 Lynette has already shown a few sneaky peeks of some of the blocks on her blog and I'm hooked! Plus, they are a nice small block, so easily achieved. In fact, after deciding to be bad and go for it, I traced, stitched and attached borders easily in an afternoon. Here is the first Block. I've made a few little changes to Lynette's original suggestions for borders (I wanted the finished quilt to be a bit bigger!) and colours (at 5.30pm when the shops are all shut you use whatever coloured threads you already have in your stash!! ), but you get the idea. My biggest dilemma now is that I have to wait a whole nother month before I get the next block! Oh no!!! So, if you're looking for a nice, quick, simple, portable project to tackle that will also help you use up some of the smaller fabric scraps and off-cuts in your stash, why not pop in to Lynette's blog to say g'day and get your copy of her wonderful BOM - tell her Kris sent you!!! It will have no special effect, but I've always wanted to say that!!! Tee! Hee! Hee! Uh Oh!! Well, after a rather busy weekend, I feel like I should have been singing Willy Nelson's song "On the road again..." cos it feels like that's where I spent most of my weekend! You know how you have really quiet periods where you don't see many people and don't have any social events on - and then all of a sudden you have a week where you have at least two or three things on every day? Well, that was our weekend! 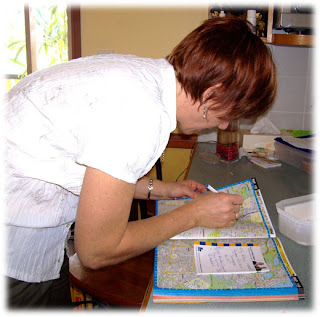 We began the weekend with pretty good intentions - Saturday morning was to be spent doing a few chores around the house before throwing a few things in a port (bag or suitcase for all non-Queenslanders!!) to leave home by 3.30pm to travel half an hour to Crows Nest where there was to be a surprise party for Scott's youngest sister, Kylie. We were also staying there the night before heading further north the next morning - but more about that in a moment! So ... here we were with all our good intentions, until we decided (read "Kris decided!") that Scott needed a haircut before a weekend of family festivities, so off we toddled to the closest shopping centre. Scott dutifully headed for the hairdresser while I went in search of shoes. Well ... 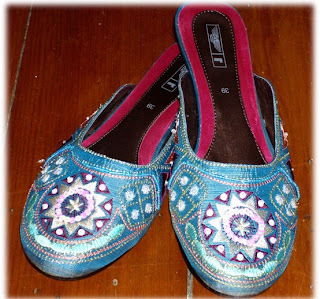 I found a gorgeous pair of shoes. Scott's haircut? Not quite so successful! Oh, it was CUT alright!!! Way shorter than I like ... but I digress! And so did we! Instead of heading home to finish the chores and pack, we kept bumping into people (and apologising! Tee! Hee! Hee!) who we hadn't seen for ages, so went from chat to chat. And then it was lunch time ... so we decided to eat at the food court. Oh dear! Time's ticking away! Finally, however, we hit the road and drove the half hour to Crows Nest, where we booked into our caravan park cabin - discovering as we drove to our spot that Scott's sister and husband were just two cabins down from us! That may sound like a good thing until you remember this was to be a surprise party - it could seriously blow the surprise if Kylie decided to go for a walk and recognised our car!! However, her hubby kept her away from our end of the cabins and she was completely surprised when an hour later she was confronted by a couple of dozen family members and friends singing happy birthday to her. She cried - and I chose to believe they were happy tears and not a commentary on our singing!! Tee! Hee! Hee! A lovely night was had by all and I would include a photo of Kylie with her birthday cake - or doing anything birthday-related, except I gave Scott the camera and he takes a little more abstract view of photography than me ... so there are no close-up, not-fuzzy photos of Kylie!! 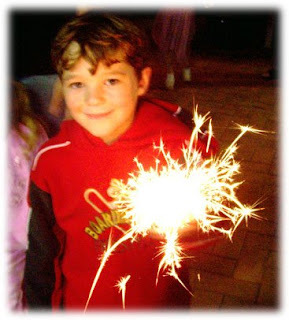 He did however, take a great photo of his nephew, Kylie's oldest son, Rohan, with a party sparkler. The next morning saw us rise and shine (well, one out of two ain't bad!!) and hit the road again to head for Bargara, near Bundaberg (the town, not the rum!) to my Grandmother's place - no Little Red Riding Hood jokes please!! You see, one of my cousins from Western Australia was in QLD to show off her almost-two year old son, Blake, who is the first (and to date, only!) great-grandchild in our family. Mum and Dad travelled from Mundubbera and we headed north so we all converged for a couple of days of catching up. Although she was very pleased to see us all, at 85 Grandma is quite used to her quiet life and was frequently heard counting down the hours until we all left so she could take a little nap to recover from all the excitement! We all had a wonderful time, chatting, eating, laughing at Blake's antics, chatting, eating ... I think you can see the pattern of the weekend's activities! Blake is a real cutie, but he's like the Energiser Bunny - he just goes flat out until the batteries go flat, has a power nap, then gets up and goes again! He reminded me of a cartoon, where the character's little feet and legs are going 100 miles an hour and they're staying on the spot - even if he wasn't actually moving forward, Blake was on the move. To demonstrate, check out this photo. 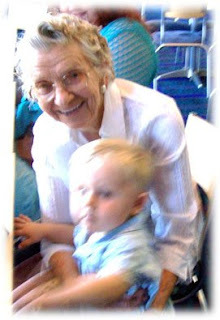 This was the clearest photo we could get of Blake and Grandma together - the camera wasn't quick enough to catch him! Tee! Hee! Hee! Although, we did manage to get him to stay a little bit still for this group photo. That's me, Grandma (who was looking at the other camera!) Tara and Blake when we hit the local tavern for a yummy lunch. Then, it was time for goodbyes and we hit the road - again!! We had a wonderful weekend, but boy were we pleased to get home and crawl into our very own bed last night! I'd like to say we're now going to settle in for some of the quiet weeks that should be the buffer between the busy bits - but looking at my calendar, I don't think that's going to be the case!! Oh dear, better go have a cup of tea to re-charge my batteries! It's as good an excuse as any! Tee! Hee! Hee!